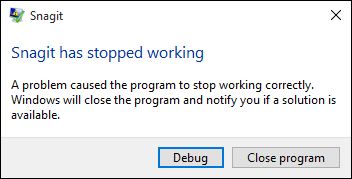 Snagit (Windows): Crash - "Snagit has stopped working"
There can be several factors that can cause an application to crash such as software bugs, hardware failure, operating system problems, and more. If you experience frequent crashes, try these solutions. Make sure you are running the latest build available for your version of Snagit. All versions of Snagit are available for download here. Select Help > About Snagit. 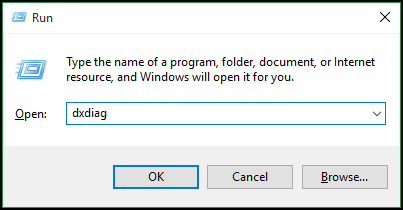 Select File > Help > About Snagit. Install Windows Updates to make sure you are running the most recent versions for dependencies and system files. Click Start in the taskbar. Select Settings > Update > Security. Select PC Settings > Update and Recovery. Install any updates that are available under the Windows Update section. Many problems can be resolved by updating the hardware drivers on your computer. This process varies across computers. The best way to check for the latest drivers is to visit the computer manufacturer's website and search for your computer model number. 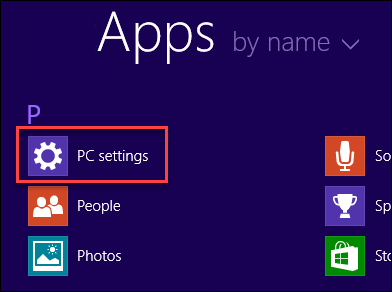 Windows attempts to find these automatically, but often there are more recent ones available. If there are specific steps that consistently reproduce the crash, then include those in the ticket. If there are no specific steps and the crash seems to be random, then please provide details about what actions you took before Snagit crashed to help our team assist you. For example, was it while capturing or was it while editing? If you can open Snagit, this text file will give us detailed information about your version of Snagit. Open the Capture Window or Snagit Editor. Attach the saved file to your ticket. Select File > About Snagit. This will tell us some additional information about your computer hardware and drivers. Press Windows + R to open Run. Click Yes to the prompt (if you see one). Once the progress bar completes, select Save All Information.